Submitted photo After graduating in April, Jacob Huff, right, honored Tyler Ohlemacher with a donation to the School of Music’s Percussion Studio. FAIRBORN — It all began during a chance encounter at lunch. 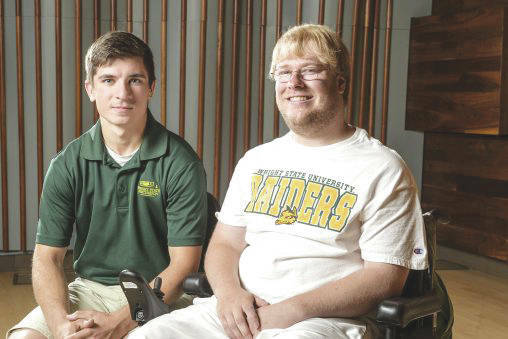 That meeting between Wright State University students Jacob Huff and Tyler Ohlemacher led to a deep and lasting friendship. And when Huff graduated in April, he honored his friend with a financial donation to Wright State, a highly unusual gesture for a graduating student. Huff, who has a physical disability that requires the use of a wheelchair, said he would not have been able to graduate without the help of Ohlemacher, a percussion student in the School of Music. “I wanted to do something he would benefit from and other students would benefit from too,” Huff said of his donation to the Percussion Studio Fund. Huff grew up in Centerville. His physical disability would often keep him from helping around the house so he would look for ways to use his strengths to help others. And when he enrolled at Wright State in 2013, he decided to major in social work. Huff once provided academic help and moral support for a fellow student who also has a physical disability, was having trouble adjusting to college life and was at-risk of leaving school. The student was later among the top graduates in the major. But Huff himself also needed help. Specifically, he needed someone to help him exercise in the campus swimming pool. That’s when Ohlemacher sat down at Huff’s lunch table. “It started from there,” Huff said. For the next two years and to this day, Ohlemacher has helped Huff exercise in the pool. During the spring semester, Huff had to complete a practicum for his social work degree that required him to go to an agency for 15 hours a week. It was a huge logistical challenge for someone with a physical disability like Huff. In fact, it could have been insurmountable. But not if you have a friend like Ohlemacher, who did what had to be done to make sure Huff was able to complete his practicum. And Ohlemacher was helping at a time he himself was carrying a full academic load and sharing his music skills in the community. It was the kind of selflessness that made a lasting impression on Huff. So in January, Huff began to save what money he could. By graduation he had $100. He spent $37 of that on an accessory for graduation called the Stole of Gratitude, which honors a person who has supported the graduate — namely Ohlemacher. Then Huff donated the rest of the money in Ohlemacher’s name to the Percussion Studio Fund, which supports the percussion program by such things as repairing musical instruments or helping fund student trips to music clinics and presentations. Music became a part of Ohlemacher’s life at a young age. Growing up in Englewood, he took piano lessons when he was in elementary school and become deeply involved in band. He gravitated toward percussion instead of brass instruments. “I just can’t blow a horn,” he said with a chuckle. After graduating from Northmont High School in 2016, he enrolled at Wright State to major in percussion performance and music education and to study under Gerald Noble, director of percussion. In addition to his studies, Ohlemacher has helped teach marching band at Wilmington High School and Newton High School. In 2017, he began teaching music and drum line in after-school programs and summer camps at the Dayton Kroc Center, a community center run by the Salvation Army. He also gives private lessons and works as a receptionist in the College of Liberal Art’s School of Music. After graduation, Ohlemacher would like to gain experience by performing on a cruise ship, then build his reputation in Nashville or Los Angeles before moving to New York. He recently returned from a trip for a Broadway percussion clinic at New York University. “My dream is to be on Broadway as a percussionist,” he said. https://www.fairborndailyherald.com/wp-content/uploads/sites/50/2018/07/web1_Tyler-Ohlemacher-Jacob-Huff-20214_003-508×339.jpgSubmitted photo After graduating in April, Jacob Huff, right, honored Tyler Ohlemacher with a donation to the School of Music’s Percussion Studio.